Welcome to the first blog post of the Opencaching North America blog! You can read the introduction about who we are to the right of this post. We are a free, volunteer run and volunteer funded Geocaching listing site. So as you can see, this blog is a standard free Google Blogspot blog. We will eventually host it on our own server, although we have to do some domain name ownership shuffling amongst the Admins first. Then we may move to WordPress, or other such dedicated blogging software. I am Mr.Yuck, the primary author of the blog. But you can call me Jim (last name undisclosed). I am from the Buffalo, N.Y. area, and have been Geocaching since August, 2003. 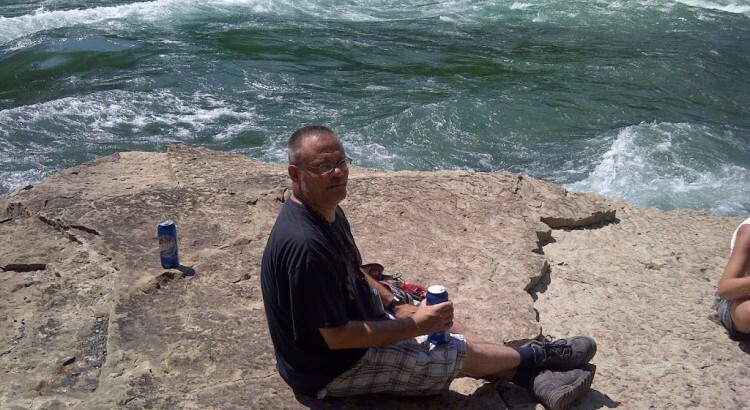 There are very few pictures on the Internet documenting my existence, but I managed to dig this one up in someone else’s Geocaching log (taken July, 2012); this is me enjoying a 24 ounce can of Labatts Blue after a 1.2 mile hike to a .50 Cal ammo box. That’s the lower Niagara River rapids (i.e. below the Falls) in the background. 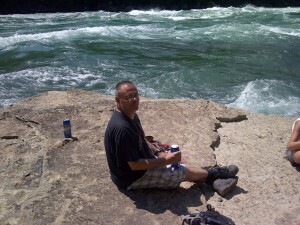 I joined Opencaching North America (then Opencaching.us) on the day of it’s official launch, August 18th, 2010. I guess you can say I’ve always been an alternative Geocaching website kind of guy. I blame this on the oldest alternative site, www.navicache.com originally being started in Rochester, N.Y. about 90 miles from where I live. Many of the early 2001-2003 caches in my area were cross-listed on that site, and many of those cache owners knew the owner of that site personally from Geocaching events. So I just went with the flow, and cross-listed my caches there. I later joined www.terracaching.com (founded in late 2004), and www.gpsgames.org (founded in 2002, but didn’t start listing Geocaches until 2005), and of course Opencaching.us when it came along. I should note that I’ve always used www.Geocaching.com and have been a premium member since February, 2004. How can you not use Geocaching.com? I just feel it’s a good thing that there are alternatives out there, and I use them. Oh yeah, another thing, I’ve been playing Munzee since July 2012, and have captured about 130, and deployed about 20 there. Not too much of a fanatic for that game yet. About this blog: Ideally, I would like this to be a “Geocaching in the news”, and general interest Geocaching blog, along the lines of the great www.notaboutthenumbers.com blog. I would like people to read it even if they don’t create an account, or visit our website. But we want you to, obviously. I say ideally, because I’d be lying if I didn’t say a decent portion of the posts will be about “us”, or our fellow alternative Geocaching websites. You can expect to see posts about Geocaching in the news (say for example, a major bomb scare incident), interviews with “famous” or interesting Geocachers, as well as “Sporadically featured OpencachingNA members” (as opposed to a regular cacher of the week or month) and “Sporadically featured OpencachingNA caches”, again not a regularly scheduled feature. I will also pursue many subject matter experts to write guest blog posts in their area of expertise. Oh yeah, and I plan on giving stuff away!! Being the blog for a Geocaching listing service, although admittedly a small one, does carry some weight. Once we get some decent readership numbers, I can see sponsors donating prizes to give away, also like the notaboutthenumbers blog. We are excited to be the first U.S. based alternative Geocaching website to launch their own blog. Thanks for reading, and please come back again!